This was a real long break, I am sorry, I was away attending to some work. Bimal Roy was my father’s favourite director, he revered him, however, besides Roy, there were some other directors with whom my father enjoyed working and Hrishikesh Mukherjee topped that list. Those days Mukherjee was acknowledged as the industry’s best editor. He used his editorial skills to great effect while directing his films. My father used to say, “Hrishida edits the film in his mind while directing a film”. He was at ease both with comedy and serious films. While I surreptitiously wiped my tears after watching Aashirwaad, Satyakam and Anand, I found myself in splits while watching Chupke Chupke. Usually when I see the Hindi remakes of Bengali originals, I usually prefer the originals, but as far as Chupke Chupke was concerned I loved Hrishikesh Mukherjee’s version, the Bengali version was absolutely tame in comparison. I could do several posts just focusing on Hrishikesh Mukherjee’s films but as I have restricted myself to my father’s films, I will just talk about Satyakam and Anupama. Incidentally, when I asked him, with which film was he most satisfied, he unhesitatingly replied, “Satyakam”. It is only right therefore, that I begin with Satyakam. I thought I would do just a single post on Mukherjee, but on going through my interview with him, I realized that would be difficult since I had plenty to share with all of you. Coming back to Satyakam, I have seen several films based on novels, some have been good adaptations, while others have been a huge disappointment. It is apparent while watching these films that, either the director did not understand what the novelist wanted to convey or he perhaps thought that he knew better and sought to “improve” upon the novelist’s work. Hrishikesh Mukherjee was different, he did make changes, after all you have to when adapting a novel for the celluloid, but he stayed true to the novelist’s vision. Satyakam was one such film. I have once again taken advantage of Tube Chop and chopped off some clips from You Tube, I feel there is no better way to illustrate one's post on a film, than by posting clips.If you are wondering why I have mentioned the duration of the scenes, well that is just to assure you that I haven't embedded the whole film. young man who went in search of God, when he neared the Himalayas he learnt the best way to reach God is to seek the truth and spread the message of truth. This young man Satyanarayan Acharya, in order to fulfill this mission, married and settled down in a village and started a Gurukul. All his descendants’ names had the prefix Satya (truth) because they all lived for the truth and nobody could ever accuse them of lying. Acharya (Ashok Kumar) to bring him up. The story begins in the year 1946 just before India’s independence. Satyapriya, Narendra and their group of friends are about to finish their education and are hopeful of the future. The country’s independence fills them with joy; they are sure that corruption, hunger, unemployment will now come to an end. that her foster parent Rustomji (David) is pushing her into the arms of the Prince, thereby trying to ensure a life of luxury for her. consequently Ranjana becomes a victim of the Prince’s lust. Consumed with guilt, Satypriya decides to marry Ranjana, eight months after his marriage he takes his wife and baby boy to meet his grandfather. The grandfather is shocked to learn that Satyapriya has married a woman who has no clue about the identity of her father, and the child is not his grandson’s biological child. He refuses to have anything to do with Satapriya. There is a vast difference in the career graph of the two friends, while Narendra moves up the ladder, Satypriya, who is unwilling to compromise on his principles, keeps changing jobs and consequently does not make much progress in life. Years later Narendra finds himself in the position of Satyapriya’s boss. It does not take him long to see how unpopular his friend is, thanks to his fight against corruption. There is this particular scene (watch the clip below) in the film where one man refers to Satyapriya as a very bad man for he does not accept bribes. compromise on his principles and pass the bills, Satypriya refuses to do so, as a result the two friends have a heated argument. Once again the friends are separated. After some passage of time, Narendra learns that his friend is on his death bed. The story by Narayan Sanyal is moving with a heartwarming end. The performances by all the actors are brilliant, the dialogues which are more less translations from the novel, tug at your heartstrings. While watching the film, you see that Hrishikesh Mukherjee has stayed true to the story. During the course of the interview, he told me, “Personally I feel that my primary job as a director is to tell a story. The novelist uses the ink in his pen (this interview was taken when computers were not as ubiquitous as they are now) to write a story, while I use a camera. The emphasis should be on the manner in which the story is told rather than on the colour of the ink. When I plan a visual, images automatically surrender to me. It was Bimalda who told me ‘Think intensely and the visual images and sounds will automatically surrender to you.’ And this is how I go about planning and composing my shots. very intelligently worked around Robi Ghosh’s inability to speak Hindi, by establishing him as a Bengali who is not too comfortable speaking Hindi. After doing so, he refrained from converting the character into a caricature as is usually done with the countless South Indian and Bengali characters that you see in our Hindi films. When a non-Bengali or non-South Indian tries to imitate a Bengali or South Indian accent, he/ she seldom gets it right, in fact it is downright offensive. In this case, as both Robi Ghosh and Hrishikesh Mukherjee are Bengalis the comic scenes were just perfect. There is, for instance, this scene where Chatterjee (Robi Ghosh) tells Satyapriya that he would like to have a sumptuous meal or as we say in Hindi pet bharke khana. There is a similar phrase in Bengali, but there is also another phrase ek pet khawa which literally translated would mean to have one stomach of food, so you have Chatterjee who doesn’t know Hindi saying, main ek pet ka nahin do pet ka khana khaunga. Thereafter he says, main daant majhke aata hoon, what he wants to say is main daant ghiske aata hoon. He uses the Bengali phrase, these dialogues made the scene very enjoyable. You can have a look at the scene below I have tube chopped this 13 seconds scene. song that much more enjoyable. How can I go on to the trivia section without discussing my father, so here is a bit about my father’s role. He plays the role of Mr. Laadia, a corrupt man who pretends to be the epitome of human goodness. Though my father’s role was short, it was a very important role. It was a very well etched role. In the book there were several corrupt characters and Mr Laadia was one of them. His presence in the novel was brief. In the film Mr Laadia’s character was created after combining all these characters. The role was so well-written and presented that you feel that is how the author intended it. You can have a glimpse of his sweet talking badmaashi in this scene below. It was a quirk of fate that brought Hrishikesh Mukherjee to films in the year 1945. He was a B.Sc with Chemistry honours and used to teach at a girls school. His maternal grandfather objected to him teaching at a girls school and he therefore had to give up his teaching job. He soon found himself a job at the film processing laboratory of New Theatres. Subodh Roy who was an assistant editor at New Theatres, was a friend of Mukherjee. He requested Mukherjee to help out in his spare time. Mukerjee informed me, “Those days editing was done directly on the negative, so only a person knowledgeable in these matters could do this work. This is how I got into the field of editing. Subodh Roy was my guru as far as editing was concerned.”. It was Bimal Roy who gave Mukherjee his first break as an editor for the Bengali film Tathapi. After this he edited several films at New Theatres. Being academically inclined, Mukherjee was keen on acquiring a masters degree. He therefore quit New Theatres to continue with his studies, however fate once again intervened. He happened to meet Bimal Roy on the streets of Calcutta; Roy was then planning to go to Bombay and he invited Mukherjee to join him. That was it, his fate was sealed, he never had to look back after that. father offering a cigarette to Sanjeev Kumar with a movement of his head. I suddenly realized while watching the scene that he wasn’t really acting, he had the habit of doing that in real life too. See the clip below. I will continue with Hrishikesh Mukherjee in my next post and this time the focus will be Anupama. Shilpi, Daer aaye durust aaye! :) And you were working at Screen in '92? Heck, we were almost neighbours! I was at The Sunday Observer at the same time. :) Talk about coincidences! Satyakam is a favourite film of mine. Do you know that Hrishikesh Mukherjee once said that he stopped making serious films after the box-office failure of Satyakam? Dharmendra was also very disappointed. It was his first home production. :( Perhaps, if this film had been a hit, then we might have seen a different Dharmendra on screen. Actually Anu, I used to freelance, I never worked for any publication and btw I also freelanced for the Weekend Observer, wonder whether you were there at that time, quite likely you were. Yes the box-office failure of Satyakam was huge disappointment for Dharmendra and Hrishikesh Mukherjee and I guess for my father as well. Well people just could not relate to the story. That's really interesting, Shilpi. I used to work for the Weekend Observer. I'm surprised we never ran into each other! What a small, small world this is turning out to be. Well people just could not relate to the story. Yes it is a small world Anu. You see Anu in my life also I have seen that honesty is not the best policy, if you are honest and straight forward and do not believe in beating around the bush people just do not like you, I guess that is why the writer had Satyapriya say in anger "Honesty is not the best policy". Echoing what Anu writes: Yes, I remember reading too, in an interview with Dharmendra, that after he didn't get any awards for his performances in Satyakam and Anupama, he simply gave up putting much effort into his acting. Yes Madhu I remember him saying that at the Filmfare Awards function when he was given the Life Time Achievement trophy. You and your mother had every reason to be proud of such a father. My father played the crook and corrupt man in countless films but in real life he was just too honest and quite a simpleton. Not surprising therefore he was quite popular in the industry. Oh you would have loved him, he was very affectionate, full of fatherly affection, children just loved him. Shilpiji, Dharmendra, Hrishikesh Mukherjee, Satyakam - all my favourites are featuring in this post, so how can I not like this post? I remember Dharmendra mentioning in an interview that this movie was his home production and he had to mortgage his bungalow. I believe it flopped (yes! hard to believe) and he underwent many hardships. No wonder he had a long list of movies released the next year in 1970, so he must have signed that many to make up for the loss. Yes it was a quite blow for him, he had given his heart, soul and of course money to this film but it all backfired. Just discovered your blog. This is like hitting a gold mine. 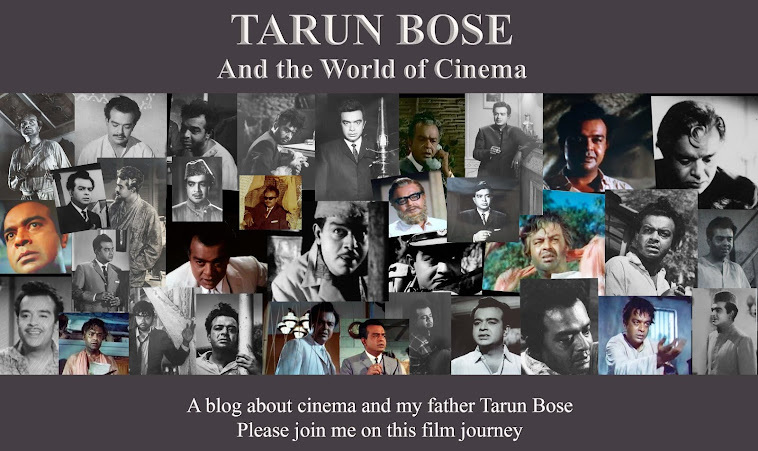 I became a huge fan of Mr Bose after I watched Anupama, I also liked him in Gumnaam and Sujata. I'm about to start reading rest of your blog posts and then look online for Satyakam's DVD to order. Thank you so much for your posts (I'm eagerly waiting for one on Anupama). Welcome to my blog Rohit, thank you very much for your kind comments. Many people have told me that they are eagerly waiting for my post on Anupama, my request to you and everyone is that you will have to wait a bit for it as personal matters keep me busy and I am not able to take out time for the post. I hope that when I do publish my post you enjoy it as much you did this one. Oh, that was such an enjoyable read, Shilpi. You've told so much and described so much in a really simple, flowing manner in your writing. Unfortunately I can't read the interview. Too small. Even when I enlarge it doesn't go beyound a certain size. I'll see if I can do something there. Satyakam is a beautiful film, and goes very well with the present scenario of corruption finally being spoken against and loudly. That movement of your father's head when offering a cigarette is such an endearing one, Shilpi. I was touched that you could see your father there as he was. Thanks Reeba, as for the article, hold on a bit I plan to add a pdf file of the article in my next post, so you should not have a problem. if you do have a problem even then, I can send you the pdf file via email. Hope you enjoy it, only problem it is sure takes me a long time to get my posts ready.